Shawnee head coach Joe Kessler and his players celebrate with the trophy after the Group 4 state championship game against Newark East Side at the Louis Brown Athletic. It was a good day for civil disobedience. It was a good day for Shawnee's students to ignore the public-address announcer in the Rutgers Athletic Center and pour on the court in celebration of the Renegades' 56-53 victory over Newark East Side in the Group 4 state championship game. It was a good day for a little defiance, as the fans were just following the lead of their basketball team. "Keep doubting us!" Shawnee senior Dylan Deveney screamed to the heavens at midcourt, after the final buzzer sounded and the Renegades had stunned the kind of North Jersey powerhouse that has bedeviled South Jersey teams in recent years. Shawnee head coach Joe Kessler and his players celebrate with the trophy after the Group 4 state championship game against Newark East Side at the Louis Brown Athletic Center. 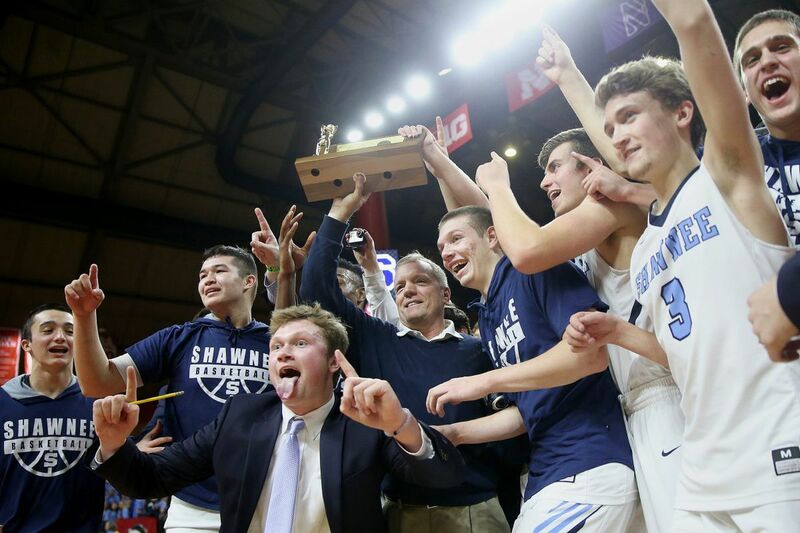 Shawnee (28-4) won its sixth state title, its first since 2007 and its first in Group 4 since 2001 by emerging on top of a game with wild momentum swings and eight lead changes in the fourth quarter. Junior guard Connor Deveney scored the winning points, converting a put-back layup off a missed free throw by senior guard Dean Noll with 13 seconds on the clock. That bucket gave Shawnee a 54-53 lead, and the Renegades dodged trouble when Newark East Side missed two free throws at the 0:02.7 mark, with the blue-clad student section from Medford in full roar behind the basket. "Got to give our fans credit for that," Shawnee coach Joe Kessler said. Dylan Deveney, a senior forward, scored 18 points and Noll added 15 for Shawnee, which advances to the Tournament of Champions. Senior swingman Daevon Robinson added 11 points with five rebounds and five assists for the Renegades. "Incredible," Kessler said in his first comments in the postgame interview. "Just an incredible basketball game." Shawnee’s Dylan Deveney (44) and Connor Deveney (25) embrace in the final seconds of the Group 4 state championship game against Newark East Side at the Louis Brown Athletic Center. It was a remarkable game. Shawnee could not have played any better in the first quarter, hitting its first six three-point attempts in building a 23-2 lead en route to a 25-7 advantage after the first eight minutes. The second quarter was a complete reversal, with Newark East Side outscoring Shawnee 24-6 as the teams went to the locker rooms deadlocked at 31-31. "We need the [halftime] break," Kessler said. "Even when we were up 20, we told the kids that Newark East Side was too good of a team to fall there. They were going to make a run." Senior forward Kane Feudtner's late bucket gave Shawnee a 43-40 edge after three and set the stage for a taut fourth quarter. The teams traded baskets and the lead for much of the quarter, with Noll hitting a foul-line jumper off the move for a 47-46 lead and converting an up-and-under scoop shot for a 49-48 lead. Shawnee’s;s Dean Noll (31) shoots past Newark East Side’s Mikah Johnson (24) during the Group 4 state championship game at the Louis Brown Athletic Center. Newark East Side (29-4) got strong work from Shamir Johnson and Anas Amos to keep retaking the lead back from Shawnee. Noll said Shawnee's experience from 2017, when the Renegades dropped a decision to Linden in the state title game, was key to the team's success. "We used that as motivation," Noll said. Shawnee was projected to return its top seven players from last season's team, but the Renegades lost starters Pat Kernan, a junior guard, and Sean Heine, a senior swingman, both to knee injuries. "I've learned never to doubt these kids," Kessler said. "They've been through so much adversity." Amos' layup at 1:57 and Hassan Ceesay's free throw at 1:33 gave Newark East Side a 53-51 lead. The Renegades missed a jumper at 1:04 but retained possession when the officials ruled the ball had been touched last by a Newark East Side player. "I was pointing our way and hoping the ref would agree with me," Dylan Deveney said. At 0:15, Noll drew a foul. He made the first but after a timeout, missed the second. Connor Deveney worked into the lane, grabbed a tip by Robinson and deposited the winning points. "Connor doesn't get nervous," Kessler said. Two missed free throws by Newark East Side and two made ones by Noll at 0:00.7 finished the scoring, and when the horn sounded, Shawnee's fans rushed the court despite the public-address announcers admonition to stay in the stands. "Three security guards are not going to hold back hundreds of kids," Dylan Deveney said. It was a good day for that kind of stuff, for stunning the experts and maybe bending the rules a bit. "They weren't going to listen," Robinson said of Shawnee's fans. "When we win a big game, I love to bring the crowd on the court. They've been our friends forever." NES: DeAndre Speight 4, Mikah Johnson 6, Anas Amos 9, Jenkins Jahid 7, Shamir Johnson 7, Hassan Ceesay 7, Keron Williams 13. S: Daevon Robinson 11, Connor Deveney 8, Dylan Deveney 18, Kane Feudtner 4, Dean Noll 15.